The workplace is often used as the default view for CRM users as it provides easy access to the activities view which allows activities to be filtered in various different ways. The workplace navigation pane is divided into two with the My Work area (described below) and the customers area allowing access to accounts and contacts (leads are available in the sales section). You can also select the Personalise Workspace option to bring up the user settings for CRM also available from the tools-options menu. · Activities to view tasks, appointments, emails, and so forth owned by the current user or colleagues or still in a queue (see the activities chapter). 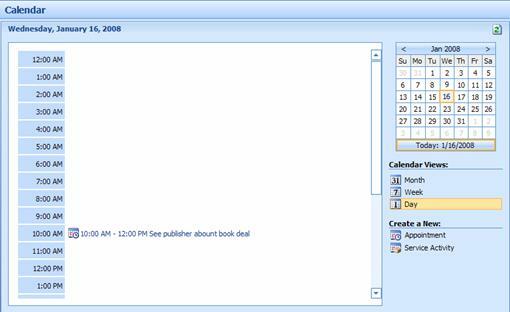 · A calendar showing appointments and scheduled activities for the current user (there is a more sophisticated calendar in the service area). · Imports shows the current status and history of bulk imports (see the data management chapter). · Duplicate Detection helps identify and resolve duplicate records imports (see the data management chapter). · Queues are used to receive incoming emails and as a collective area for assigning activities (especially cases) that have yet to be assigned a specific owner. · Articles are available from the knowledge base (see the services chapter). · Reports providing access to reports and the ability to create and edit reports or change the default filter criteria. · Announcements showing the latest news. The workplace calendar shows appointments and service activities for the current user and provides a monthly, weekly, or daily view. You can also add new appointments and service activities from here. There is a more sophisticated calendar (which shows other users and resources) in the Service work area and you should note that appointments, service activities, tasks, and some other activities may be synchronised with Exchange and viewed from your Outlook client independently of CRM. Note: There are third party applications available to provide better calendar views from CRM data. Assigning ownership of an activity to a user will add the activity to the Assigned Queue so the user can view newly assigned activities, select them and click the Accept button to take on ownership of the activity and move it to the In Progress queue. A queue is often set up to accept emails from customers directly from a customer support email address (the CRM Email Router automatically copies the incoming emails into the appropriate queue). Ownership of a new incoming email can be allocated by workflow rules or selected users instructed to browse the queue and assign items to themselves or other users. Automatically allocated emails initially join the Assigned queue of the user and can be progressed normally as each user accepts the activities assigned to them. Occasionally the user might return the item back to the queue or assign it to another user. Note: Queues are an integral part of working with the service functionality of CRM. Activities (including incoming emails) can be converted to a lead, opportunity or a case using the appropriate toolbar button or option from the action menu. This will automatically complete the activity and further action might begin if appropriate workflow is set up to create new activities as old ones are completed. Announcements are used to show the latest news and new items can be easily added (by users with the appropriate permissions) using the settings-administration-announcements form. Each announcement has a deactivation date and you can set the announcements to be the default page as the user starts up CRM each morning to make sure that new messages are viewed. The personalise workplace option allows you to define your user settings. · Number of records to be shown in a View. · Default work area and pane. · Time zone and default currency. · Regional formatting characteristics for date and decimal formatting. · Email synchronisation settings for Exchange integration. · Preferred user interface language. 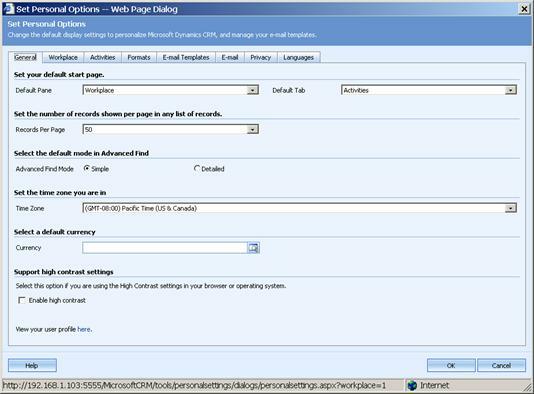 Note: Some of these options are also available in the Outlook Client for CRM together with additional options to control the synchronisation process (see the section on the Outlook Client).